It’s the tail-end of the Dry Season (Musim Kering) here in Central Kalimantan. 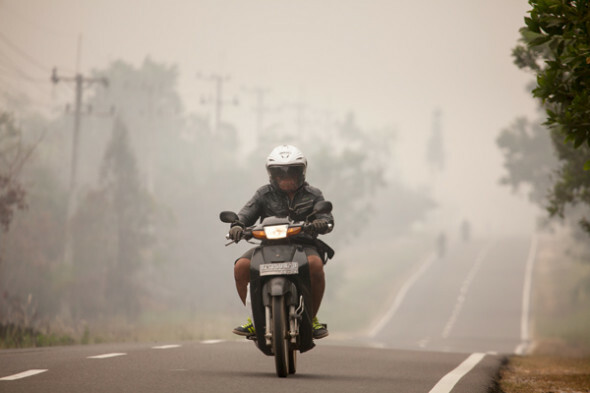 Here (and in parts of Sumatra) it’s also known as Musim Kebakaran (‘the Burning Season’), because of the prevalence of man-made fires in the forest and farmlands. 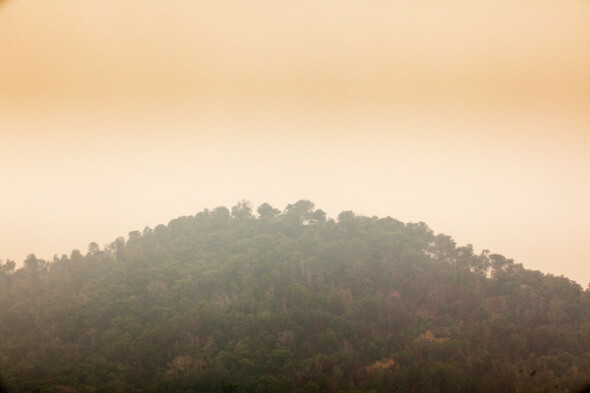 From piles of rubbish and raked-up leaves, to garden plots, scrubby farmlands, entire forests – it seems like the whole landscape is being progressively turned into smoke and ash. 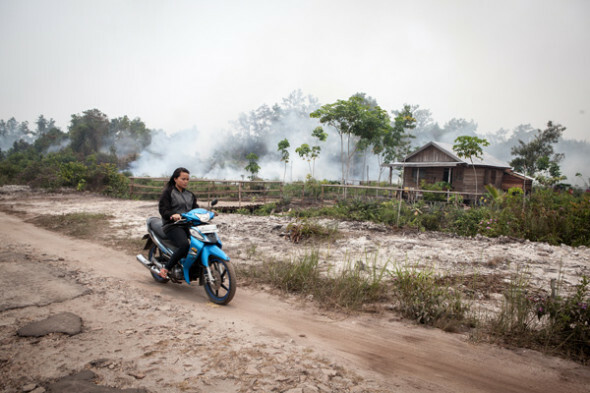 Even the ground is smouldering in places, because much of it consists of dried-up peat swamp, often metres deep, and once fire gets a hold … it just keeps burning. The Dayak people have always used fire to clear small areas of forest in preparation for planting dryland rice and vegetables. But it was done on a small scale. Now everyone, not just shifting cultivators, is doing it. With much larger-scale cultivation of plantation crops (particularly oil palms), very large areas of both primary and secondary growth forest are being cleared, by chainsaw and fire. Indonesia has now overtaken Brazil as the ‘world leader’ in deforestation. And the fires have become an international issue, with Malaysia and Singapore complaining every year about the massive smoke clouds drifting over from Indonesia. Most, if not all of the fires are illegal, and national and regional governments regularly announce crack-downs, prosecutions and punishment of offenders. There’s even a website that uses high-res satellite imagery to give live updates of ‘hotspots’ across the archipelago. However, a just-completed independent audit of the 17 largest forestry firms in Riau found that none of them (not one!) managed even a 50% score for compliance with the regulations. Along the Trans-Kalimantan Highway which is our main road here (locally known as Jalan Tjilik Riwut), there is an anti-fire billboard every few hundred metres. 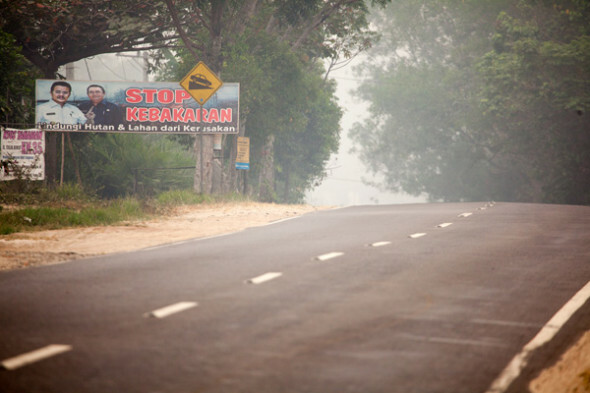 They proclaim, alongside a picture of the provincial Governor: “Stop Fires! Protect forests and fields from damage”. There’ll often be a smoking or burning field behind the billboard. In Sumatra, the government has taken to handing out face-masks to passengers as they arrive at the airports. Here the Palangkaraya airport is often closed because the smoke is too thick for pilots to land their planes. Pre-schools have closed, and primary schools were all closed for two days last week. Vehicles drive with headlights on throughout the day. We actually haven’t been affected too much by the smoke haze. 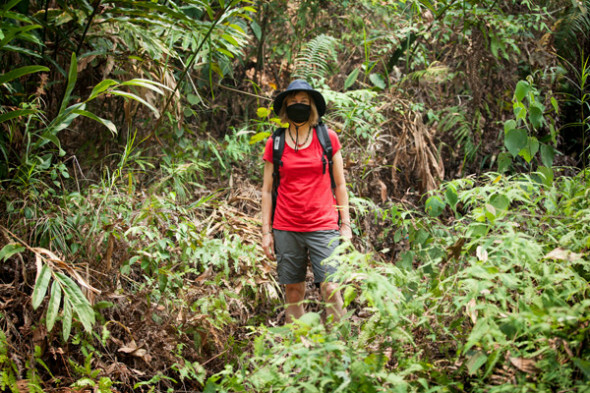 It seems to have a cumulative impact on the health; some of the expats who have been here for the longest are suffering more than us, with several going to places with clearer air (like Bali – or even Jakarta!) for relief. Local people (by and large) don’t have that option, and so endure by being stoic. 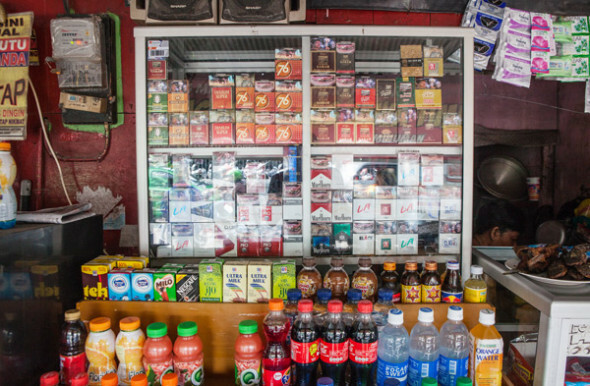 And, speaking of smoke, could it be that attitudes to tobacco smoking are changing? When we were here five years ago, I remember reading that 70% of adult men in Indonesia smoke every day (women almost never smoke), and that there were some 5 million people working in the tobacco industry (as growers, hand-rollers of kretek cigarettes, distribution and sales etc). That made the industry a pretty powerful lobby, and there seemed to be little push to reduce tobacco consumption. Now you can still buy and smoke cigarettes anywhere and everywhere, though the price has gone up to about A$1.60 per packet of 20 (i.e. around 10% of the price in Australia, often for the same brands). Advertising for cigarette brands is still seen everywhere (on billboards, shop banners, posters), often with those absurd Marlboro Man / James Bond / Racing Car images, and words like ’smooth’, ’taste’, ‘mild’, ’satisfaction’ and ‘fresh’. But there doesn’t seem to be as many people smoking as there were five years ago, and cigarette packets now carry warning pictures – mostly Grim Reaper-style images, and some of the graphic diseased-tissue photos as on Australian packets. We hear people acknowledging the negative health impacts of smoking – five years ago there were people telling us that smoking is good for your throat and lungs! My work colleagues were joking recently about the foolishness of people who assiduously wear smoke masks all day, only taking them off in order to have a cigarette! This entry was posted in Human landscapes, Indonesia and tagged Central Kalimantan, Kalimantan Tengah, Kubut asap, Smoke, tobacco. Bookmark the permalink.